Senator John Walsh (D-MT) has reintroduced the Bring Jobs Home Act. The act would provide a tax credit for 20 percent of a firm’s costs incurred “bringing jobs back” to the United States (text here). Sen. Debbie Stabenow (D-MI) first introduced the act in 2012, though it failed to pass the Senate. While politically popular due to the conventional wisdom that U.S. companies are “shipping jobs overseas,” this act rests on a flawed assumption: that companies have shipped jobs overseas, thus making it possible to bring them back. In fact, the data say otherwise. Shortly after the release of the bill in 2012, we put together data on total layoffs and layoffs due to job relocations from the Bureau of Labor Statistics (though it’s important to note that the BLS is not always able to track where jobs are moved). The data showed that, for years 2008 to 2010, relocations (shifting jobs from one location to another) comprised between 3 and 4 percent of total mass layoffs (layoffs of 50 workers or more). Among the small amount of layoffs that can actually be attributed to relocation (3 to 4 percent), the majority of moves happened between states, not countries. In fact, the proportion of out-of-country relocations dropped from 33 percent in 2008 to 29 percent in 2010 of all relocations with a known destination. Additionally, relocations out of the country make up less than 1 percent of total layoffs and dropped from 0.75 percent of total layoffs to 0.49 percent from 2008 to 2010, with most relocations happening within the same company. This trend continued in 2011 and 2012. The total amount of layoffs occurring due to relocations (domestic and international) declined in 2011 and 2012, only accounting for 2.8 percent and 2.2 percent of total mass layoffs, respectively. Within those jobs lost due to relocation, the amount of jobs being “shipped overseas” declined from 0.34 percent of total layoffs in 2011 to 0.21 percent in 2012, with most relocations still occurring within companies. While the total number of layoffs is down in recent years, the chart and table below show that layoffs resulting due to job relocation have decreased in recent years. 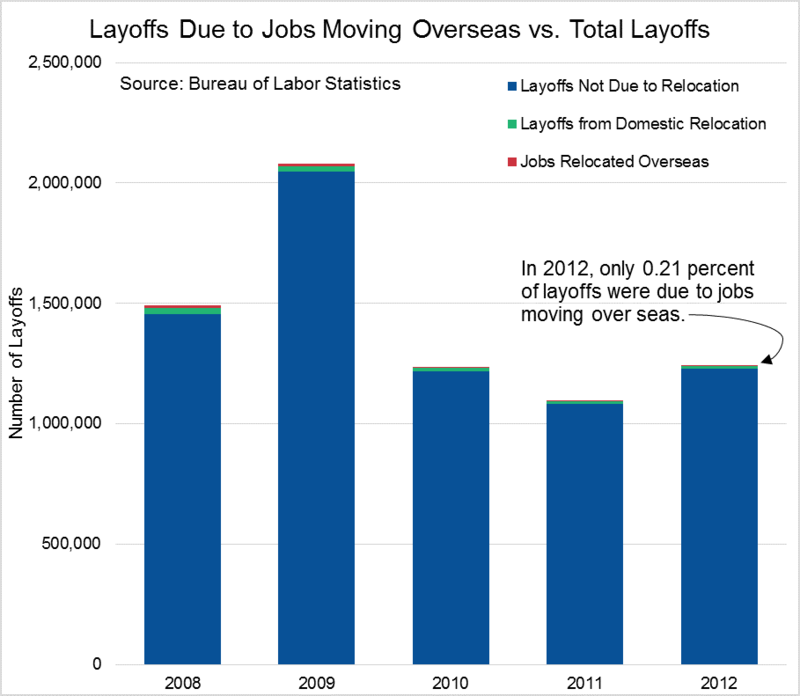 Over the same time, the number of jobs moved overseas continue to make up less than half a percent of total layoffs. The first time we discussed this in 2012, the conventional wisdom that US companies were “shipping jobs overseas” had little basis in fact. Two years later, with 2011 and 2012 data as evidence, this trend is becoming stronger as an even smaller proportion of mass layoffs are occurring due to any form of relocations (4 percent down to 2.2 percent), and even fewer of these jobs are being relocated overseas (from 0.75 percent down to 0.21 percent). While the second iteration of the Bring Jobs Home Act may still play well politically, there is little reason for the tax credit the act would create. In fact, the credit would likely result in a windfall for companies that claim the credit for jobs they planned to create without it. Instead of political gimmicks, policymakers should focus on real reforms that grow the economy and create jobs here at home. Update: This post has been updated to reflect Sen. Walsh as the lead sponsor of the bill.